This Morkie / Yorktese nicknamed Popeye Love My Puppy sold and went to a new family. 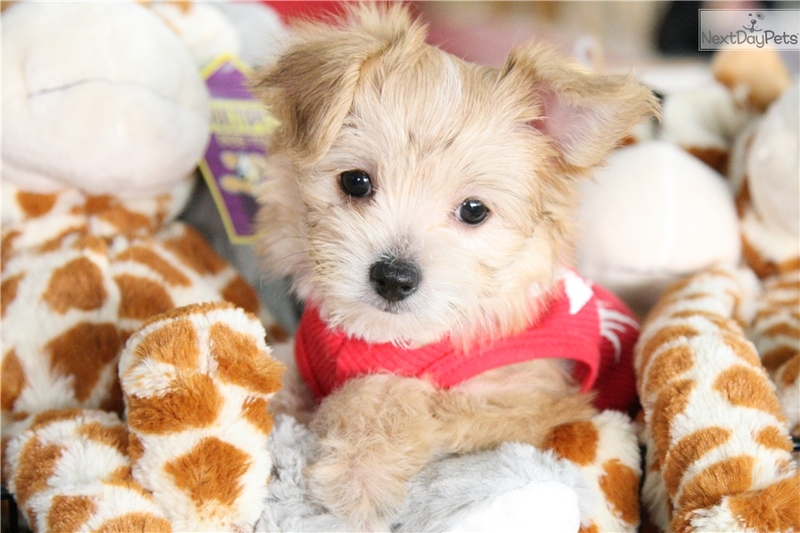 Popeye is a dapper, little, cream, Morkie [Maltese & Yorkie]. The Maltese is spirited, lively and playful. Gentle, loving, trusting and devoted to its master. Highly intelligent. Good at learning tricks. . It is a classic companion dog: graceful and lovable. It does well with other non-canine animals and other dogs. Maltese love to play outdoors. The Maltese is a good dog for apartment life. They are very active indoors and will do okay without a yard. The Maltese was developed in Italy. It is said to have miniature spaniel and Poodle blood. The Maltese was first recognized as a breed in Malta, where it received its name. It was once known as "Ye ancient dogge of Malta." The breed was owned by royalty all over the world. Women carried them around in their sleeves and slept with them in their beds. Yorkshire Terriers seem oblivious of their small size. They are very eager for adventure. This little dog is highly energetic, brave, loyal and clever. The Yorkie is a good dog for apartment life. It is very active indoors and will do okay without a yard. The Yorkie was created by working men of north England, who developed the breed for catching the terrible rats and mice that infested clothing mills and mine shafts. These hunting dogs could penetrate into badger and fox burrows.